Definition at line 25 of file HexagonTargetMachine.h. Definition at line 203 of file HexagonTargetMachine.cpp. References llvm::PassRegistry::getPassRegistry(), llvm::LLVMTargetMachine::initAsmInfo(), and llvm::initializeHexagonExpandCondsetsPass(). Definition at line 270 of file HexagonTargetMachine.cpp. References C, createVLIWMachineSched(), and llvm::SystemZISD::TM. Definition at line 251 of file HexagonTargetMachine.cpp. References llvm::legacy::PassManagerBase::add(), llvm::PassManagerBuilder::addExtension(), llvm::createHexagonLoopIdiomPass(), llvm::createHexagonVectorLoopCarriedReusePass(), llvm::PassManagerBuilder::EP_LateLoopOptimizations, and llvm::PassManagerBuilder::EP_LoopOptimizerEnd. Definition at line 297 of file HexagonTargetMachine.cpp. References llvm::TargetPassConfig::addIRPasses(), llvm::createAtomicExpandPass(), llvm::createCFGSimplificationPass(), llvm::createConstantPropagationPass(), llvm::createDeadCodeEliminationPass(), llvm::createHexagonBitSimplify(), llvm::createHexagonBranchRelaxation(), llvm::createHexagonCallFrameInformation(), llvm::createHexagonCFGOptimizer(), llvm::createHexagonCommonGEP(), llvm::createHexagonConstExtenders(), llvm::createHexagonConstPropagationPass(), llvm::createHexagonCopyToCombine(), llvm::createHexagonEarlyIfConversion(), llvm::createHexagonFixupHwLoops(), llvm::createHexagonGenExtract(), llvm::createHexagonGenInsert(), llvm::createHexagonGenMux(), llvm::createHexagonGenPredicate(), llvm::createHexagonHardwareLoops(), llvm::createHexagonISelDag(), llvm::createHexagonLoopRescheduling(), llvm::createHexagonNewValueJump(), llvm::createHexagonOptAddrMode(), llvm::createHexagonOptimizeSZextends(), llvm::createHexagonPacketizer(), llvm::createHexagonPeephole(), llvm::createHexagonRDFOpt(), llvm::createHexagonSplitConst32AndConst64(), llvm::createHexagonSplitDoubleRegs(), llvm::createHexagonStoreWidening(), llvm::createHexagonVectorPrint(), llvm::createHexagonVExtract(), llvm::createLoopDataPrefetchPass(), llvm::CodeGenOpt::Default, DisableAModeOpt, DisableHardwareLoops, DisableHCP, DisableHexagonCFGOpt, DisableHSDR, DisableStoreWidening, EnableBitSimplify, EnableCExtOpt, EnableCommGEP, EnableEarlyIf, EnableExpandCondsets, EnableGenExtract, EnableGenInsert, EnableGenMux, EnableGenPred, EnableInitialCFGCleanup, EnableLoopPrefetch, EnableLoopResched, EnableRDFOpt, EnableVectorPrint, EnableVExtractOpt, llvm::TargetMachine::getOptLevel(), llvm::HexagonExpandCondsetsID, llvm::IfConverterID, llvm::MachinePipelinerID, llvm::CodeGenOpt::None, llvm::RegisterCoalescerID, llvm::SystemZISD::TM, and llvm::UnreachableMachineBlockElimID. 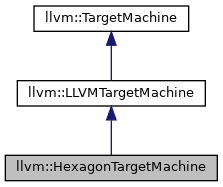 Definition at line 43 of file HexagonTargetMachine.h. 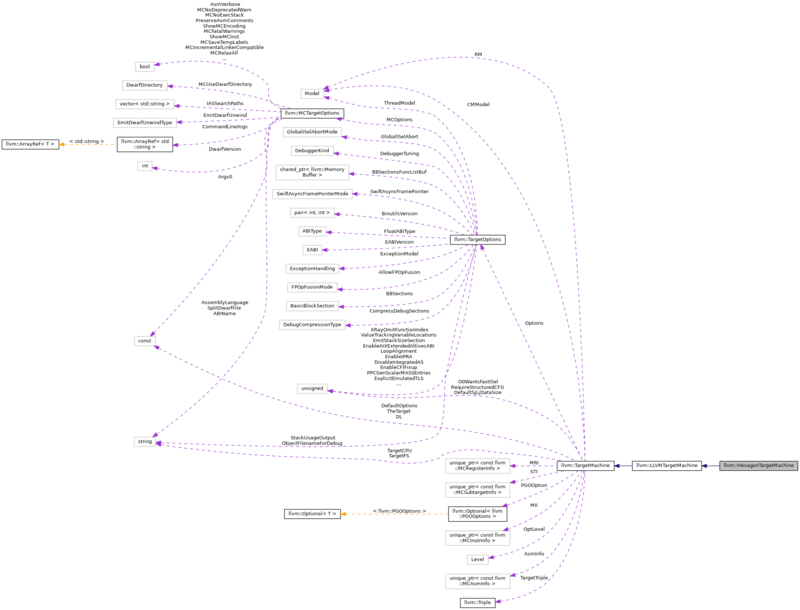 Definition at line 226 of file HexagonTargetMachine.cpp. References llvm::AttributeList::FunctionIndex, llvm::AttributeList::getAttribute(), llvm::Function::getAttributes(), llvm::Attribute::getValueAsString(), llvm::Attribute::hasAttribute(), I, llvm::Attribute::None, llvm::TargetMachine::resetTargetOptions(), llvm::StringRef::str(), llvm::TargetMachine::TargetCPU, llvm::TargetMachine::TargetFS, and llvm::TargetMachine::TargetTriple. Definition at line 265 of file HexagonTargetMachine.cpp.